Russian Video: The Twentieth Century Approaches (Movie)! Today we are watching the last part of Soviet TV-Series about Sherlock Holmes and Dr.Watson: The Twentieth Century Approaches (Двадцатый век начинается), 1986. So today we’ll meet again Vasily Livanov as Sherlock Holmes and Vitaly Solomin as Dr. Watson, Rina Zelyonaya as Mrs. Hudson and the director of all this series Igor Maslennikov. For Sherlock Holmes fans: The film is based on 4 stories by Conan Doyle – “The Adventure of the Engineer’s Thumb”, “The Adventure of the Second Stain”, “The Adventure of the Bruce-Partington Plans”, “His Last Bow”. If you did not watch all the Russian series about Sherlock Holmes yet – you can find them here: Sherlock Holmes and Dr. Watson on Russian Video from Russia. This entry was posted in Movie for the weekend, Sherlock Holmes on May 30, 2009 by admin. Russian Video: The Adventures of Sherlock Holmes and Dr. Watson (Movie: The Treasures of Agra)! Today we continue (if you just joined to us please take a look at Sherlock Holmes and Dr. Watson on Russian Video from Russia) watching Russian movies about Sherlock Holmes and Dr. Watson with genial Livanov as Sherlock Holmes. “The Adventures of Sherlock Holmes and Dr. Watson: The Treasures of Agra” was made in 1983 and became the fourth part of Russian series about Sherlock Holmes. This movie consists of two episodes based on The Sign of the Four and A Scandal in Bohemia. This entry was posted in Movie for the weekend, Sherlock Holmes on March 28, 2009 by admin. Russian Video: The Adventures of Sherlock Holmes and Dr. Watson (Hunt for the Tiger)! I know that our friends from Sherlock Holmes Clubs all over the Internet looking forward for the last part of the great Russian movie about adventures Sherlock Holmes and his friend Dr. Watson. The end of the second part was awful we all have seen that Sherlock Holmes fеll from the cliff… I never forget the look at Watson’s face when he realized that’s all over. So today we are finishing these series what was made in 1980 and named “The Adventures of Sherlock Holmes and Dr. Watson“. I just want to remind you that “The Adventures of Sherlock Holmes and Dr. Watson” has 3 parts: “The Master-Blackmailer“, “Deadly Fight“, “Hunt for the Tiger“. A good news is that we’ll continue publishing Russian movies about Sherlock Holmes and Dr. Watson so stay with us –> Subscribe to Russian Video from Russia RSS-Feed or get news from our blog on your email! We’ve published already a lot of Russian movies about Sherlock Holmes with English subtitles. Look at our Index: Sherlock Holmes and Dr. Watson on Russian Video from Russia! This entry was posted in Movie for the weekend, Sherlock Holmes on March 6, 2009 by admin. Russian Video: The Adventures of Sherlock Holmes and Dr. Watson (Movie: Deadly Fight)! As always at weekends we’ll watch a full-time movie. Today on Russian Video from Russia we continue watching our Sherlock Holmes series. That is the second part of the second Russian movie about Sherlock Holmes and Dr. Watson. Let me explain: the first Russian (really Soviet) movie about Sherlock Holmes was made in 1979 and we already watched it: Sherlock Holmes and Dr. Watson. The second TV movie about Sherlock Holmes and Dr. Watson was made in 1980. That’s “The Adventures of Sherlock Holmes and Dr. Watson”. We already watched the first part of this movie The Adventures of Sherlock Holmes and Dr. Watson (The Master-Blackmailer). Today we are watching the second part of the movie “Deadly Fight” (based on The Adventure of the Final Problem). This movie “The Adventures of Sherlock Holmes and Dr. Watson” divided on three episodes: “The Master-Blackmailer“, “Deadly Fight“, “Hunt for the Tiger“. And we will watch them all! This entry was posted in Movie for the weekend, Sherlock Holmes on February 27, 2009 by admin. Russian Video: The Adventures of Sherlock Holmes and Dr. Watson (Movie: The Master-Blackmailer)! This weekend we are continue watching these great Russian Movies about Sherlock Holmes and Dr. Watson. This time the movie named “The Adventures of Sherlock Holmes and Dr. Watson” and was made in 1980 (Приключения Шерлока Холмса и доктора Ватсона: Король Шантажа). Today we are watching the first episode: “The Master-Blackmailer” (based on The Adventure of Charles Augustus Milverton). We already watched the beginning of the movies about Sherlock Holmes. 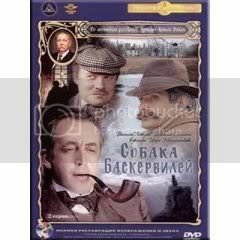 Start fom this one: Russian Video: Sherlock Holmes and Dr. Watson (Movie: Acquaintance)! This entry was posted in Movie for the weekend, Sherlock Holmes on February 20, 2009 by admin. Russian Video: The Hound of the Baskervilles/Собака Баскервилей (Movie)! Today we continue watching famous Russian screen versions of Arthur Conan Doyle stories about the greatest detective Sherlock Holmes and his companion Doctor Watson. The Hound of the Baskervilles (Собака Баскервилей) movie was made by Igor Maslennikov as a movie director in 1981. Russian Video: Sherlock Holmes and Dr. Watson (Movie. Part.1)! We are going to watch a second part of movie! This entry was posted in Movie for the weekend, Sherlock Holmes on January 4, 2009 by admin. Russian Video: Sherlock Holmes and Dr. Watson (Movie: Bloody Inscription)! Russian Video: Sherlock Holmes and Dr. Watson (Movie: Acquaintance)! Today we are watching a movie: Sherlock Holmes and Dr. Watson (1979), Second episode: “Bloody Inscription” (based on A Study in Scarlet). A lot of watchers admire the music in Sherlock Holmes movies. The author of this music is Russian composer Vladimir Dashkevich. Composer of music for more than 70 Soviet and Russian movies, was born on the 20th January 1934. Music from the movies was 5 times nominated for Nika award and one time it won Nika. Vladimir Dashkevich tells: The music for Sherlock Holmes movie was composed without any afford. His friend and director of the movie Igor Maslennikov constantly called him from Leningrad (where they were shooting the movie) to Moscow and reminded that was time to compose the music. When he called me the third time I did not want to upset him took the phone closer to piano and started to play the first what came to my head. That’s how the famous overture was made. When someone accused Picasso for panting one of his masterpieces for 15 minutes. He told that he painted it 15 minutes and whole life. I could tell about the music the same. I love the Conan Doyle stories from my childhood and this music was born in me long long time ago, it just waited its time to sound. People tells that the music was composed in English style. I think that is the dream about beautiful and romantic England, a dream what was born in Russia. To download the music from the Sherlock Holmes movies you can on the site: Music from Sherlock Holmes Movies. When you click on music-link first you’ll see Yandex page (because Yandex hosts these files with mp3) click on the mp3-link and you’ll get the music. Next year we’ll continue to watch Russian movies about Sherlock Holmes and Doctor Watson. This entry was posted in Movie for the weekend, Sherlock Holmes on December 27, 2008 by admin. Do you like detectives? I love them. Every day when I am riding metro to work and back home I am reading detective stories. And if I don’t have a new one I think that I just waste my time in metro. But tastes are different and may be you don’t like detectives that much, but I am sure that you still love Arthur Conan Doyle’s stories. And today we will watch the best screen version of his stories. How do I know that the movie is the best screen version that’s because when you visit museum of Sherlock Holmes in London on Baker Street on the second flour you will see pictures of all actors who’ve ever played Sherlock Holmes and the biggest portrait in the middle of wall is a picture of Vasiliy Livanov (who played Sherlock Holmes in this movie) and everybody (even cinematographers from Great Britain) admits that he was the best. So now we have a chance to watch a real story of real Sherlock Holmes. Today we are watching a movie: Sherlock Holmes and Dr. Watson (1979), First episode: “Acquaintance” (based on A Study in Scarlet and The Adventure of the Speckled Band). This entry was posted in Movie for the weekend, Sherlock Holmes on December 20, 2008 by admin. Sherlock Holmes and Dr. Watson on Russian Video from Russia! Only here you can watch all Russian Sherlock Holmes series with English subtitles! 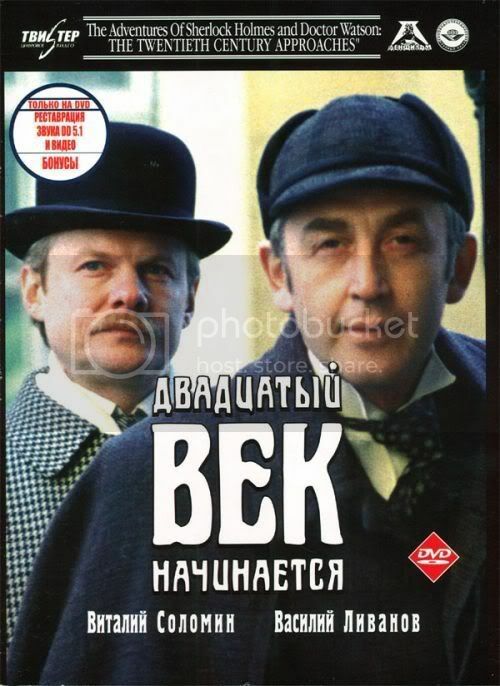 Between 1979 and 1986, Soviet television produced a series of five films at the Lenfilm movie studio, split into eleven episodes, starring Vasily Livanov as Sherlock Holmes and Vitaly Solomin as Dr. Watson. Later, a cinematic adaptation was made based on the 1986 episodes. This film was called The Twentieth Century Approaches. Two episodes Russian Video: The Adventures of Sherlock Holmes and Dr. Watson (Movie: The Treasures of Agra) – based on The Sign of the Four and A Scandal in Bohemia. 1986 The Adventures of Sherlock Holmes and Dr. Watson: The Twentieth Century Approaches. Don’t miss another Russian movies — Subscribe to RSS or get our news on email. This entry was posted in Sherlock Holmes, Site Map on March 4, 2007 by admin.